Recently, I spent the afternoon hiking with my island family of close friends to Jacks & Isaacs Bay on the East End of St Croix. It had been several years since I’d been down there and I had remembered a somewhat strenuous hike with a bit of rock climbing involved, so I was a little concerned about the little tikes (2-5 year olds) coming along with us. Boy, was I pleasantly surprised! 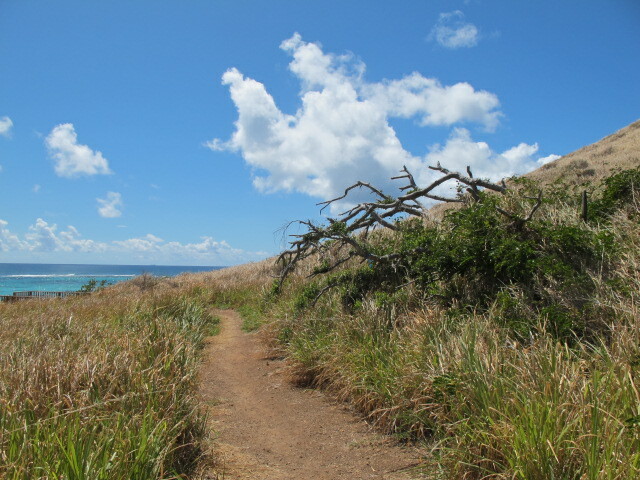 The trail that leads from the small parking area just before Point Udall has been widened and well maintained. The hike is now more of a leisurely stroll (though do keep your eyes out for rocks in the path) that can easily be done in a comfortable pair of flip-flops. I packed a small shoulder cooler with some lunch and a few beers and carried a backpack with other essentials (sunscreen, towel, hat, etc). Some of my friends hauled down a cooler on wheels filled with refreshments – they whined the whole way, but they did it! ha ha. There are no facilities at Jacks & Isaacs, but that’s part of the reason the beach is still so beautiful and pristine. (Between the trek and the lack of facilities, you won’t see throng of people and thus it stays really clean and beautiful) Be sure to bring along a snorkel and fins if you have them, the East End marine park is known for some of the best off-shore snorkeling on the island. … or if you’re like us, just float in the water and “lime”. 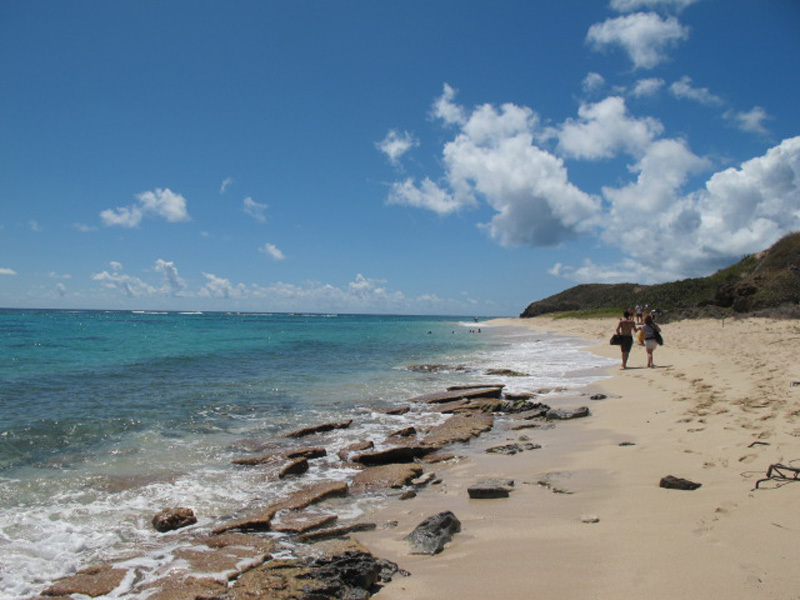 Note: This area of the island is prime nesting beach for green sea turtles from approximately August thru October. If you hike out during this time of the year, you’ll likely see huge craters of sand created by the greens when they make their nests. Remember not to dig holes above the water line or plant beach umbrellas in the sand as these can harm the endangered turtles’ nests. If you are on the beach late in the day around sunset – you may witness hatchlings running for the water. Be sure not to handle them and prevent them from making their way straight to the water, they need all the energy they have to brave the predators waiting for them in the water.